RESTful Webservice to send and receive secure text messages from any application. 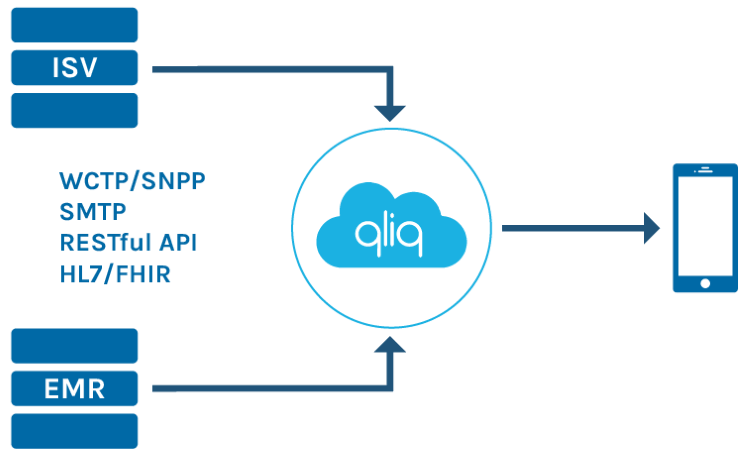 Our integration engine, QliqDIRECT, makes HIT integration one Qliq away. Contact us at [email protected] to learn how we can bring secure communication to your HIT systems. Send messages via HTTPS using RESTful API. Receive replies when the recipient replies to message securely. Send messages to entire group or subgroup. Notification of a message being read. Send and receive pictures, documents, audio files as attachment. Use SCIM API to add, remove, or update user information. Add, remove and update Subgroups. Add, remove, update subgroup membership for users. Automatically update contacts on both mobile and desktop app. Easy, three step, five-minute setup. Control which users need to sync with Qliq cloud servers. Qliq provides the option to automatically sync AD groups and associated memberships. Users login to Qliq using existing AD credentials. All traffic directed from qliqDIRECT from behind your firewall. Upload secure texting conversations and attachments to a patient record inside the EMR. Providers can upload from anywhere regardless if they are signed on to the EMR.